Grimsby Town have played at Blundell Park since 1898, and at just 2 feet above sea level, it is the lowest football stadium in the UK. The club have recently announced plans to relocate to a new stadium at Peaks Parkway. The stadium was made all-seater in 1995, which drastically reduced the capacity. The Youngs Stand is the tallest of the four stands, and is two tiered. However, it doesn’t run the full length of the pitch so looks quite unique. The Main Stand is opposite, and the central section of this stand actually dates back to 1901, and is one of the oldest stands in the football league. 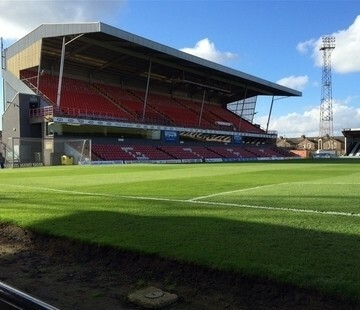 Away fans visiting Blundell Park are located in one section of the Osmond Stand, with a typical allocation of around 600. This can be increased to over 2,000 if the whole stand is allocated for bigger away followings. There is no parking available at the stadium itself, so street parking is the only option. We’ve compiled a list of parking options, below, near to Blundell Park for hassle free parking while you’re at the match. Blundell Avenue (Street Parking) DN35 7PT Free 0.2km Blundell Avenue is an option for away fans, as it is with walking distance of the stadium. Parking is unattended so it is at your own risk. Tiverton Street (Street Parking) DN35 7PP Free 0.3km Tiverton Street is an option for away fans, as it is with walking distance of the stadium. Parking is unattended so it is at your own risk. Lovett Street (Street Parking) DN35 7EA Free 0.4km Lovett Street is an option for away fans, as it is with walking distance of the stadium. Parking is unattended so it is at your own risk. The nearest station to Blundell Park is actually New Clee, though it’s unlikely the majority of fans will use this line. More likely is that fans will arrive at Cleethorpes Railway Station, which is just over a mile from the stadium. When you leave the station, head down to the sea front and turn left, and you can walk all the way up until you can see the stadium on your left hand side. Before the stadium, you’ll see a footbridge over the railway that you’ll have to cross, and then turn right. You’ll then see the away entrance on your left hand side through some houses. There are a number of away friendly pubs near Blundell Park, all of which cater to different needs. Please note, however, that some bars require club colours to be covered and some do not allow children. However, rather than take our word for it, we want to give you the view from other away fans who have visited Blundell Park. Over the coming months we will be building up fans reviews of the best places to drink on an away trip to Grimsby Town, and you’ll be able to find them here. Grimsby offers a variety of overnight accommodation to suit all budgets. See what other away fans think of Grimsby Town’s Blundell Park in our ‘Away Day Reviews’. See how Grimsby Town perform in our away day rankings, where away fans rate the pie, pint, cuppa and away day overall.